A detailed visualization of herpes simplex virus 2. Each color represents a different protein. Two teams of scientists, one in China and another in the United States, have released new up-close views of the protein capsule that encompasses herpesvirus DNA, called a capsid. They revealed some of the best images yet of the virus (or of any large virus, for that matter). And it’s an important virus to study. “A clear understanding of the structure and function of the various proteins of herpesvirus could help guide development of anti-viral agents as well as increase its utility and efficiency as a therapeutic agent for treating tumors,” author Xiangxi Wang from the Chinese Academy of Sciences told Gizmodo. 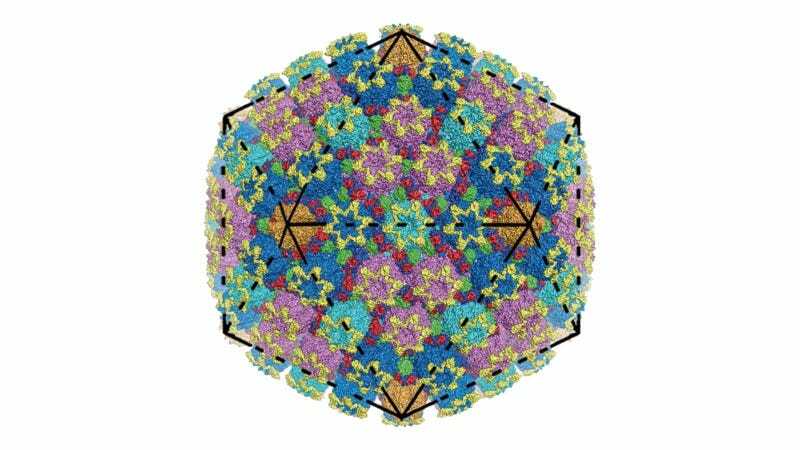 Below is his team’s new view of the herpes simplex virus 2 structure, along with a single unit of the whole capsid. The herpes simplex virus 2 capsid, below, and a single unit, above. Viruses are pretty incredible. Somehow, lots of individual protein pieces combine to form a capsule, like the hexagons and pentagons of a soccer ball or the triangles on a twenty sided die. Except in this case, it’s 3,000 or so of the same proteins arranged in a 200-nanometer ball—one of the largest viruses, but still incredibly tiny. These capsids provide the container in which a virus’s genetic material is stored, which they release order to cause infection. In the case of herpes, that can include the familiar cold sores and genital herpes infections. But other viruses in the Herpesviridae family can cause encephalitis or even cancer. The two teams of researchers used cryo-EM, or cryo electron microscopy, to take the image, according to a pair of new studies in the journal Science. The Nobel Prize-winning method involves freezing the molecule in such a way that it doesn’t crystallize, then bouncing electrons off of the object to determine its physical structure. Others have imaged the herpesvirus before, but researchers could image these molecules down to 3.5 angstrom (0.35 nanometer) and 3.1 angstrom resolution—the best so far for a small virus. This revealed the identity of the individual building blocks that make up the proteins, the amino acids. They also found that these proteins aren’t all the same—slight differences could potentially supply some flexibility to the capsule. As Tufts University researcher Ekaterina E. Heldwein, who was not involved in this study, pointed out in a commentary in the same issue of Science, neither group could resolve the portal by which DNA enters the capsule. Still, she said, these studies will be important for future investigation into the viruses’ structures. Of course there’s an end goal here, said Wang: Creating drugs that could help treat these viruses.